Marriage*: She married Pierre Le Roux. Marriage*: He married Martha Elize DeWitt. [S133] Don Brownlee, electronic mail to Roger Bartlett, 9 Jan 1996, citing 6 Feb 1956 letter from Joseph Elias Norwood printed in "General" John Norwood and Related Lines, William Howard Norwood, comp. (Dallas, Tex. : Trumpet Press, 1964), p. 233. Marriage*: She married Theodore DuBose Norwood, son of Samuel A. Norwood and Ellen Harper. Note*: He and Mary were twins. Note*: She and Joseph were twins. Marriage*: She married William Clarence Langham, son of Rufus M. Langham and Amanda Lee ('Lee') Bartlett. 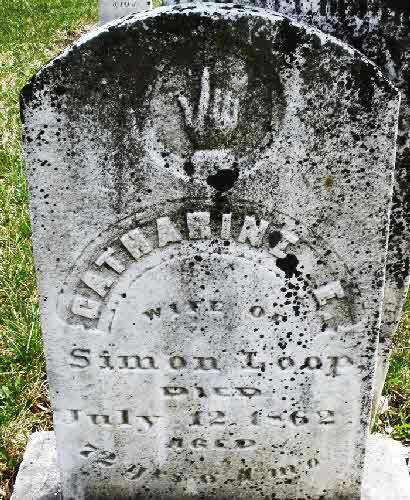 Catharine E. Loop's tombstone, Old Dutch Cemetery, Montgomery County, Ohio, from findagrave.com, by Mary Downing-Mahan. [S24] Victor L. Bennison, The Loop Family in America (n.p. : Penobscot Press, 1992), pp. 51, 52 (naming Simon Loop, or Lupp, as her father). [S24] Victor L. Bennison, The Loop Family in America, above, p. 52 (naming Mary Elizabeth Heck as her mother). [S24] Victor L. Bennison, The Loop Family in America, above, pp. 52, 53 (stating that she was born ca. 1789 in Pennsylvania). [S961] Find A Grave, online at http://www.findagrave.com, memorial for Catherine Elizabeth Loop Loop, memorial no. 66752131, viewed on 10 Jul 2011 (giving the date but no other information). [S24] Victor L. Bennison, The Loop Family in America, above, p. 51. [S961] Find A Grave, online, above, memorial for Catherine Elizabeth Loop Loop, memorial no. 66752131, viewed on 10 Jul 2011. [S24] Victor L. Bennison, The Loop Family in America, above, p. 52. [S24] Victor L. Bennison, The Loop Family in America, above, p. 53 (naming Elizabeth Catherine Loop as her mother). [S24] Victor L. Bennison, The Loop Family in America, above, p. 53 (naming Elizabeth Catherine Loop as his mother). Burial*: Interment was in Brillheart Cemetery, Virginia (near Roanoke). [S24] Victor L. Bennison, The Loop Family in America (n.p. : Penobscot Press, 1992), pp. 51, 55 (naming Peter Hipes as her father). [S24] Victor L. Bennison, The Loop Family in America, above, p. 55 (naming Sarah Briens as her mother). [S24] Victor L. Bennison, The Loop Family in America, above, pp. 51, 55. [S24] Victor L. Bennison, The Loop Family in America, above, p. 55. [S24] Victor L. Bennison, The Loop Family in America, above, p. 55 (naming Elizabeth Hipes as his mother). [S24] Victor L. Bennison, The Loop Family in America, above, pp. 55-56 (naming Elizabeth Hipes as his mother). [S24] Victor L. Bennison, The Loop Family in America, above, pp. 55-56 (naming Elizabeth Hipes as her mother). [S24] Victor L. Bennison, The Loop Family in America, above, pp. 55-56, 62 (naming Elizabeth Hipes as his mother). [S850] Linda Cyers, electronic mail to Roger Bartlett, 1 Jul 2003, (naming Elizabeth Hipes as his mother). [S24] Victor L. Bennison, The Loop Family in America (n.p. : Penobscot Press, 1992), pp. 52, 56 (naming Elias Linkenhoker as her father). [S24] Victor L. Bennison, The Loop Family in America, above, pp. 52, 56. Marriage*: She married Alexander Rogers. Marriage*: He married Sarah Borden. [S28] James Alonzo Matthews, Jr. and Lucille Pearce, comps., Pearce, Bartlett, Matthews, Smart, and Allied Families (Austin, Tex. : Eakin Publications, Inc., 1983), p. 163. Marriage*: She married Enoch McCoy. Marriage*: He married _____ Beale. [S28] James Alonzo Matthews, Jr. and Lucille Pearce, comps., Pearce, Bartlett, Matthews, Smart, and Allied Families (Austin, Tex. : Eakin Publications, Inc., 1983), p. 171. [S28] James Alonzo Matthews, Jr. et al., Pearce [etc.] and Allied Families, above, p. 171 (naming Simond Hunt as his father). Marriage*: She married Simond Hunt. [S28] James Alonzo Matthews, Jr. et al., Pearce [etc.] and Allied Families, above, p. 171 (stating that "while we have no positive proof of the maiden name of Mrs. Simond Hunt, it is fairly well established that she was a daughter of John Beale"). Charts: Pedigree of Roger F. Bartlett Sr.
[S28] James Alonzo Matthews, Jr. and Lucille Pearce, comps., Pearce, Bartlett, Matthews, Smart, and Allied Families (Austin, Tex. : Eakin Publications, Inc., 1983), p. 156 (naming Thomas Bartlett as his father). [S28] James Alonzo Matthews, Jr. et al., Pearce [etc.] and Allied Families, above, p. 156 (naming Margaret Thompson as his mother). [S28] James Alonzo Matthews, Jr. et al., Pearce [etc.] and Allied Families, above, p. 156. [S28] James Alonzo Matthews, Jr. et al., Pearce [etc.] and Allied Families, above, p. 156 (naming William Bartlett as his father). [S28] James Alonzo Matthews, Jr. et al., Pearce [etc.] and Allied Families, above, pp. 156-57 (naming William Bartlett as his father). [S28] James Alonzo Matthews, Jr. et al., Pearce [etc.] and Allied Families, above, pp. 156-57 (naming William Bartlett as her father). [S28] James Alonzo Matthews, Jr. and Lucille Pearce, comps., Pearce, Bartlett, Matthews, Smart, and Allied Families (Austin, Tex. : Eakin Publications, Inc., 1983), p. 156. [S28] James Alonzo Matthews, Jr. et al., Pearce [etc.] and Allied Families, above, p. 156 (naming Margaret _____ as his mother). [S28] James Alonzo Matthews, Jr. et al., Pearce [etc.] and Allied Families, above, pp. 156-57 (naming Margaret _____ as his mother). [S28] James Alonzo Matthews, Jr. et al., Pearce [etc.] and Allied Families, above, pp. 156-57 (naming Margaret _____ as her mother). Marriage*: She married Francis Place. Marriage*: She married Dr. Alexander Spence. 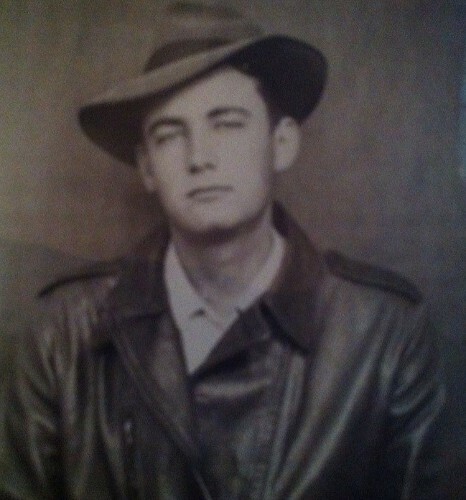 Elden Niemeier, courtesy of Shirley Niemeier Rice. Death*: He died on 22 February 1999 in Niemeier farm, McLennan County (near McGregor), Texas, at age 76. [S58] Index to Texas Birth Records (Austin, Tex. : Tex. Dept. of Health, Bur. of Vital Statistics), typescript 1923, vol. 3, p. 1082, file 10879. [S139] Barbara Bartlett, information sent to Roger Bartlett, 2 Jun 1996. Other Names*: Annie Lee Patterson Niemeier, Annie Lee Niemeier. [S1174] Waco Tribune-Herald, Waco, Tex., online at http://www.wacotrib.com, viewed on 17 Feb 2008 (obituary of Annie Lee Patterson Niemeier) (giving the date but not the place). [S1174] Waco Tribune-Herald, Waco, Tex., online at http://www.wacotrib.com, viewed on 17 Feb 2008 (obituary of Annie Lee Niemeier). [S140] Erbon W. Wise, Wise Footsteps from England and Ireland: Ancestral Study of Wise and Allied Families (Sulphur, La. : n.pub., 1995), p. 161. [S284] Linda Green, electronic mail to Roger Bartlett, 28 Aug 1997, (naming Thomas Wynne as his father). [S140] Erbon W. Wise, Wise Footsteps from England and Ireland [etc. ], above, p. 162 (citing "Compendium" , p. 401).